We woke up pretty early in the morning at about 5pm on the second day! Yes… we were a bit jet lagged. Having set our itinerary for the day, we prepared ourselves for a day full of walking. After a quick breakfast, we headed to Louvre Museum (metro stop: Palais Royal — Musee du Louvre). The museum actually opens at 9 am, but when we were there at 8.30 am, there was already a growing line up to enter the museum. 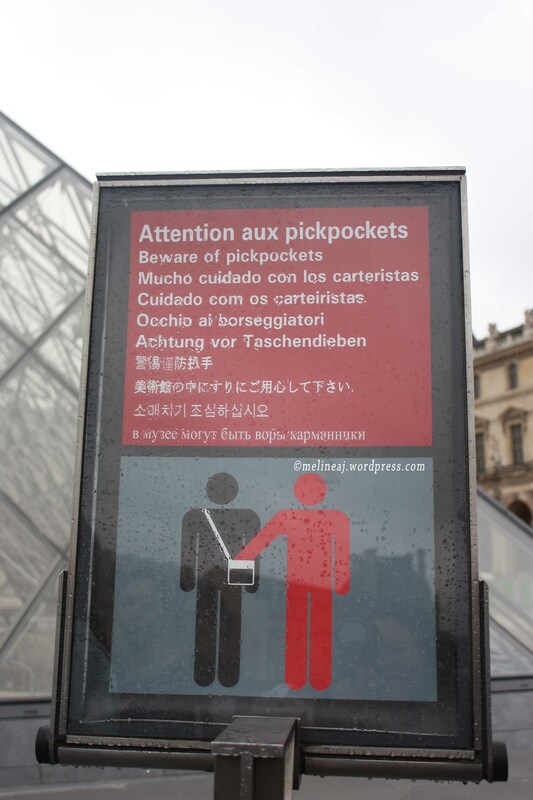 There was a sign for tourists to watch their belonging inside the museum since pickpocket is very common there. At 9 am sharp, the door was opened and we had to pass the security check. We then lined up to buy our ticket at one of the booth. However, for some reason, the booth that we queued had a super slow computer! We had to wait for another 30 minutes for buying the ticket. 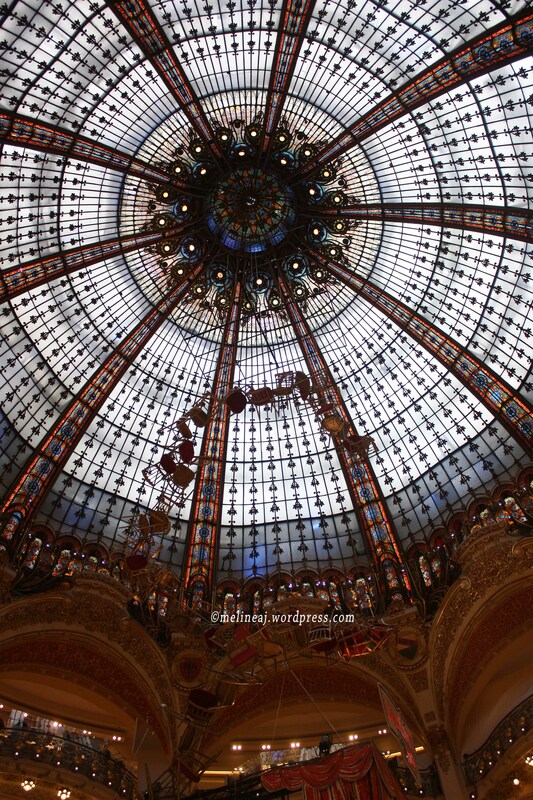 Luckily, we got some discount since we had our Paris Visite Pass (the regular ticket fee is €12). 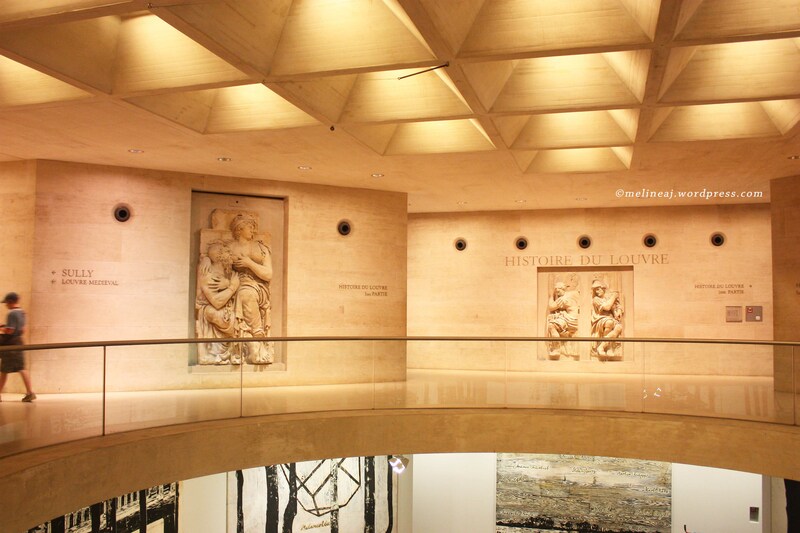 If you buy Paris Museum Pass, you can enjoy the museum right after the security check. Also, there are some ticket vending machines around that serve you faster than the booth. On Wednesday and Friday, the museum opens until 9.30 pm. For more information, see the website. 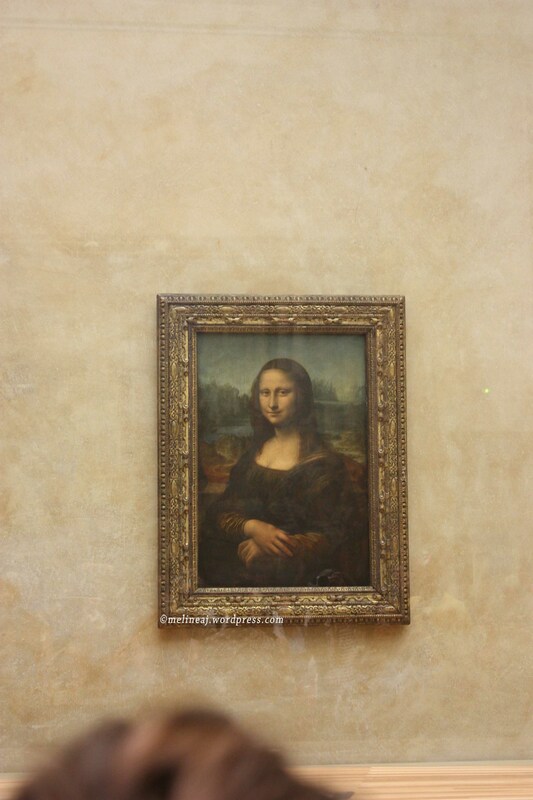 After getting our ticket & grabbing museum map, we headed to the most famous painting in the world, the Monalisa! This painting is located at Denon / South wing of the museum. 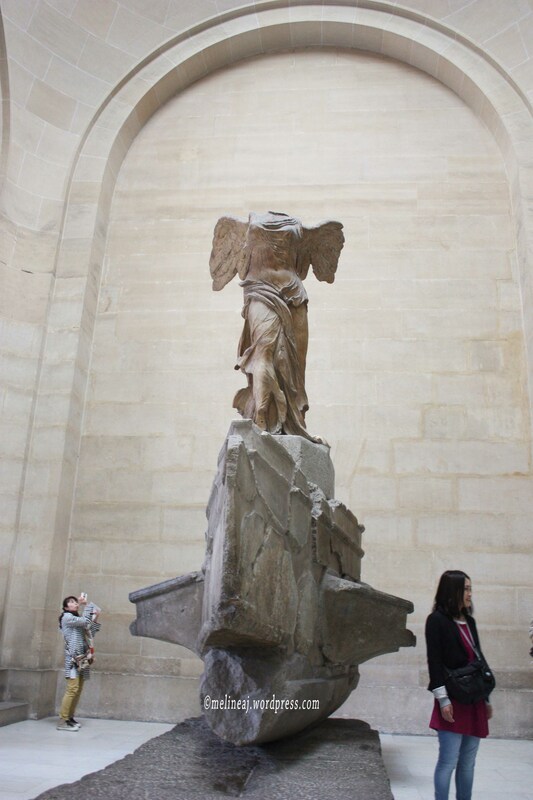 On the way to see Monalisa, we passed the statue of Winged Victory of Samothrace or known as Nike. 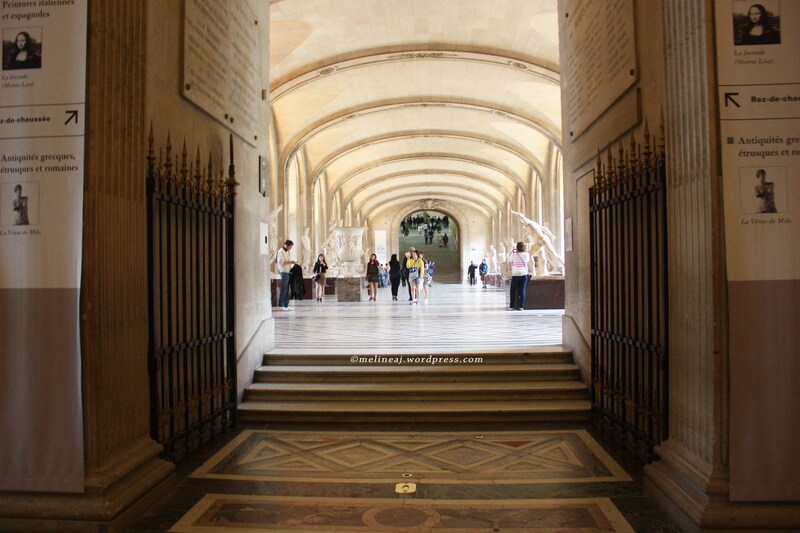 The hallway at Lourve toward the Monalisa was a long and bright one. You can see lots of paintings from famous painters like Leonardo Da Vinci. When we arrived at the room, there was already lots of tourists taking picture but since it was still early in the morning, we were lucky to be able to snap a picture with Monalisa as close as we could. 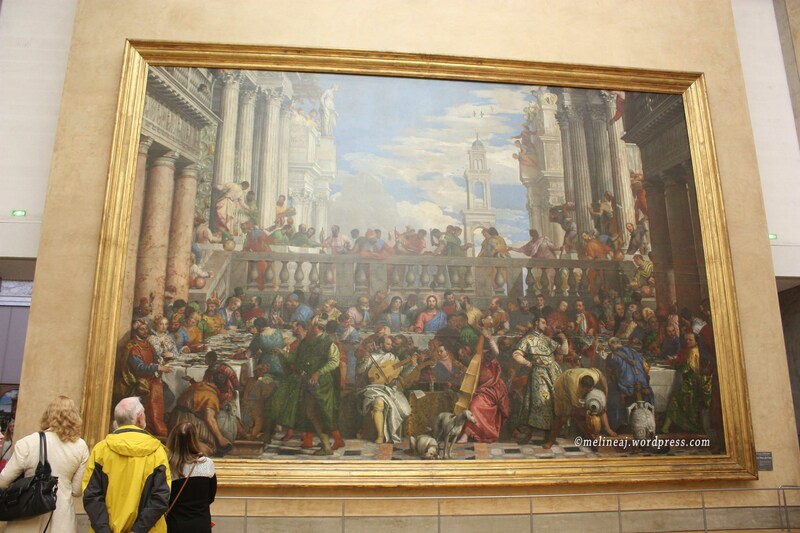 On the opposite side of Monalisa is the famous painting of The Wedding at Cana. This huge painting made me look so small. 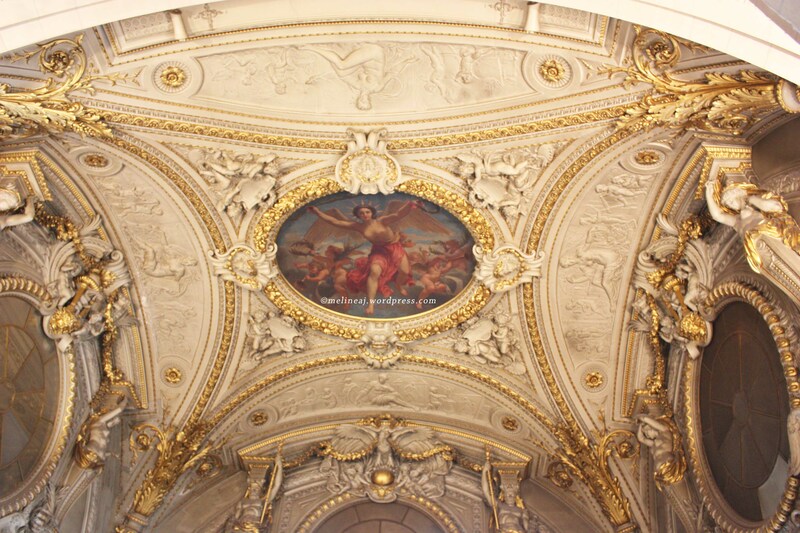 The details of the painting were really breathtaking. As we explored more on this area, we found The Coronation of Napoleon. We sat across this painting to admire this huge sized painting. How Jacques-Louis David, the painter, could remember each and every person face during the event was puzzling for us. My husband said that this is his favourite among them all. 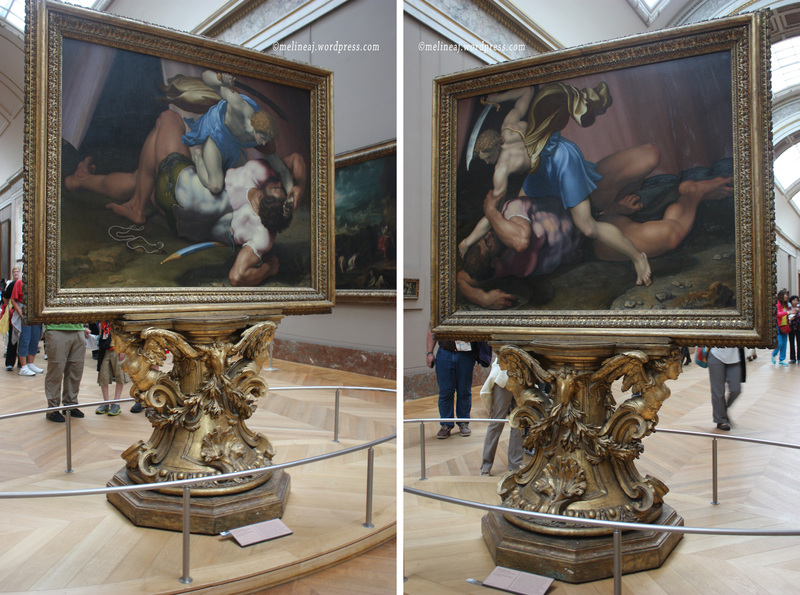 The interesting painting that we saw was The Battle of David and Goliath. This two-sided painting showed David, a slender built man, holding a sword on top of the muscular Goliath. Here, I also witnessed myself The Raft of the Medusa by Théodore Géricault. It really showed the terrible and desperation of the people on the raft while stranded at the sea. 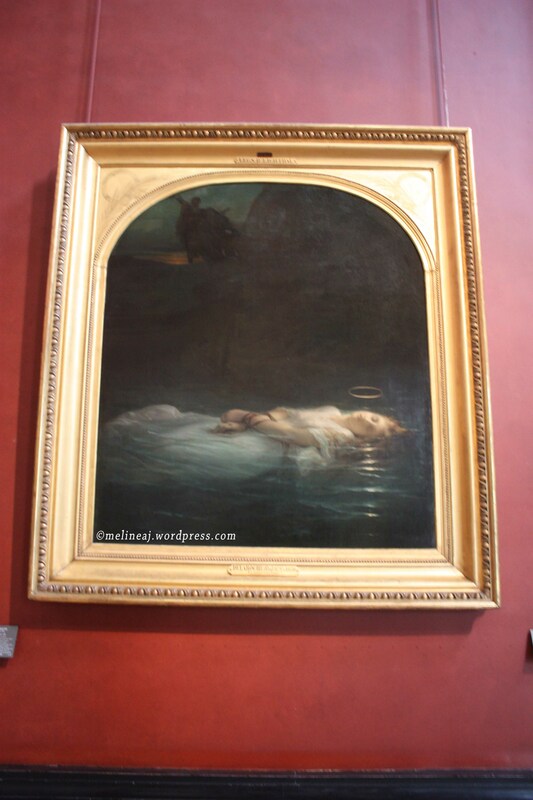 The one that caught my eyes was The Young Martyr by Paul Delaroche. This painting was both serene yet saddening. The white gown on this pale young lady looked so bright against the dark background. As the title describes itself, this painting has more meaning and symbolism than just a beautiful picture. 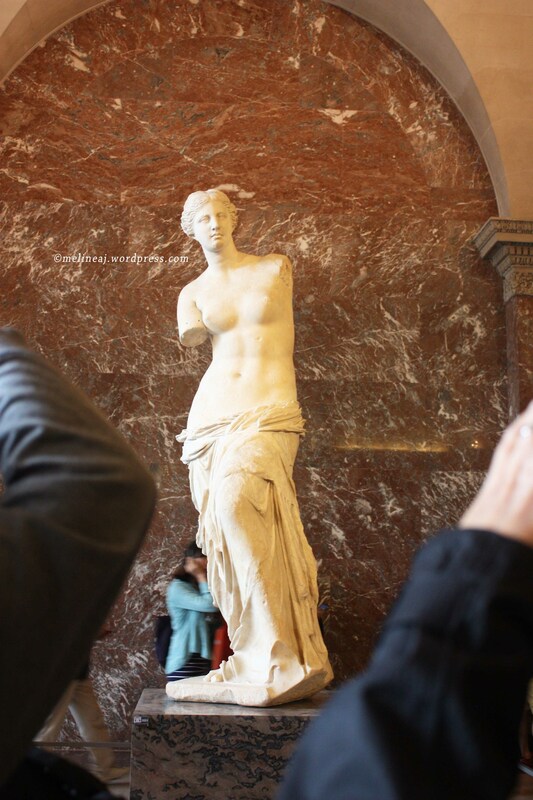 Still at Denon wing, we went downstairs to see Venus de Milo statue along with other Greek gods. When we walked toward the very end of the room, suddenly 2 security guys pushed the tourists back and said that the room was close. My curious husband lingered for awhile to see what happened. Apparently, there was an unintended diaper bag at the room which was deemed suspicious. Wow! The security there was pretty tight! As soon as the bag was removed, the room was opened. Feeling tired from walking and taking picture, we decided to grab a lunch at the cafeteria. 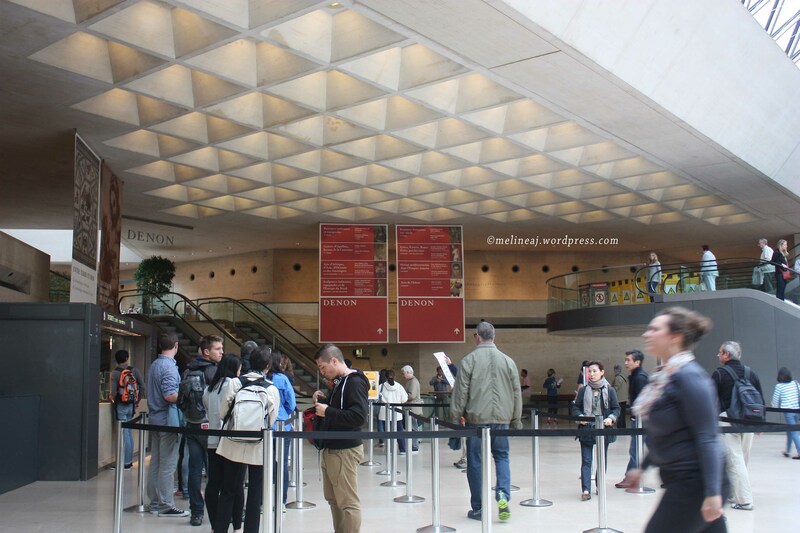 While walking toward cafeteria, we passed a stone-like structure of the medieval Louvre and there are 2 rooms by the end of this old structure explaining the development of Louvre museum from time to time (History of Louvre). At Cafes de la Pyramide, the food there was okay and like any other tourist area, it was a bit expensive. 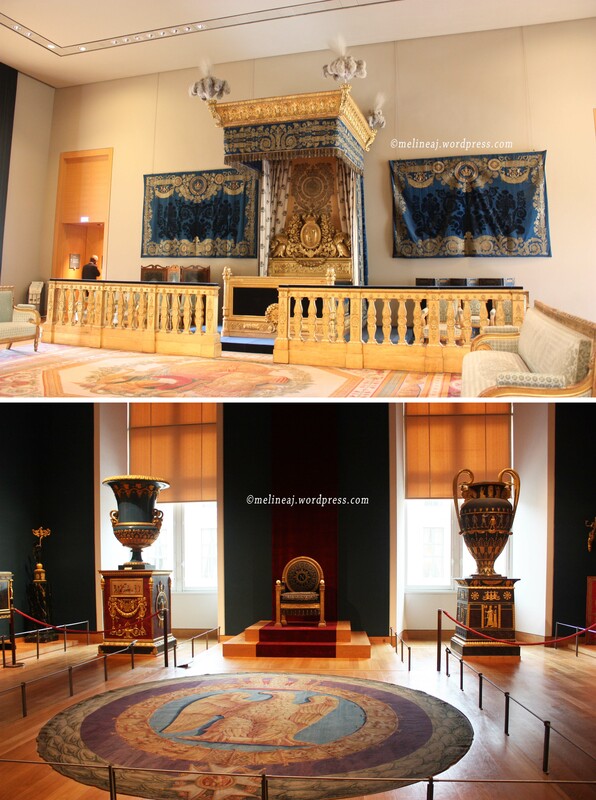 We continued our walking tour at Louvre to Richelieu Wing to see Napoleon III’s Apartment. We dropped our jaws when we entered the room. Everything was covered in gold paint and looked very grand and elegant! Apparently, if you’re a king, you can do whatever to make your house be the envy of others hahahaa…. 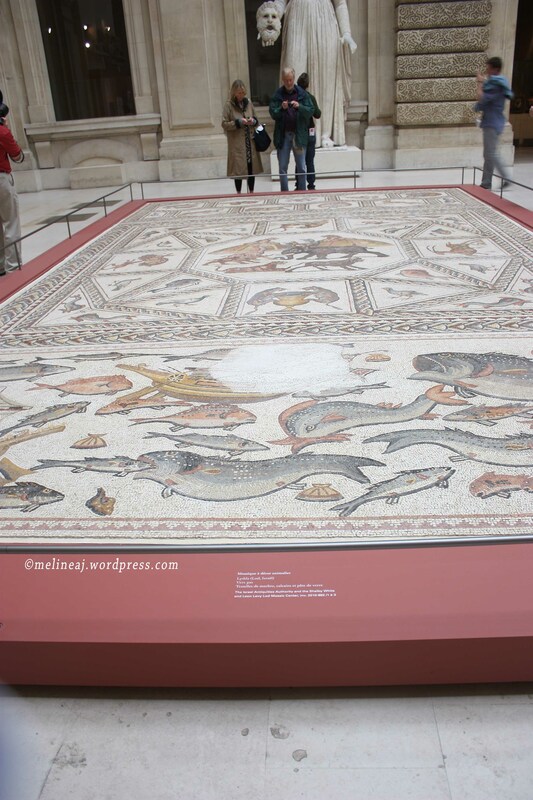 In total, we spent about 6-7 hours to explore just parts and bits of Louvre Museum. The museum shops sell different types of souvenirs from painting replica, puzzle, postcards, and knick-knack that were all about art. 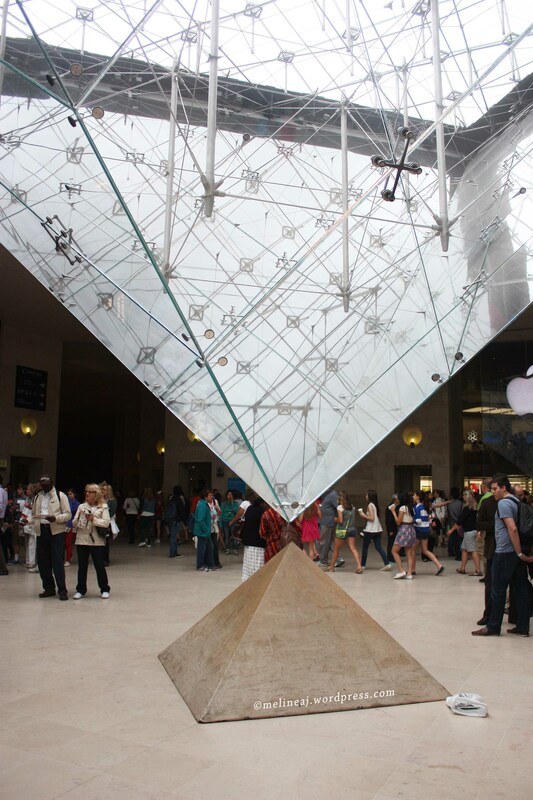 Before we left the museum, we visited the inverted Pyramid that was just at the other entrance/exit of the museum. The first thing that my husband noticed when I was about take his picture was an Apple store! Yes! They have an Apple store inside this museum… A bit ironic in my opinion. Overall, my visit to Louvre had been a good one. I can see firsthand the real Monalisa painting (well, actually the one on display is the replica… but hey, who notice it hahaha…) and other famous art artifacts. 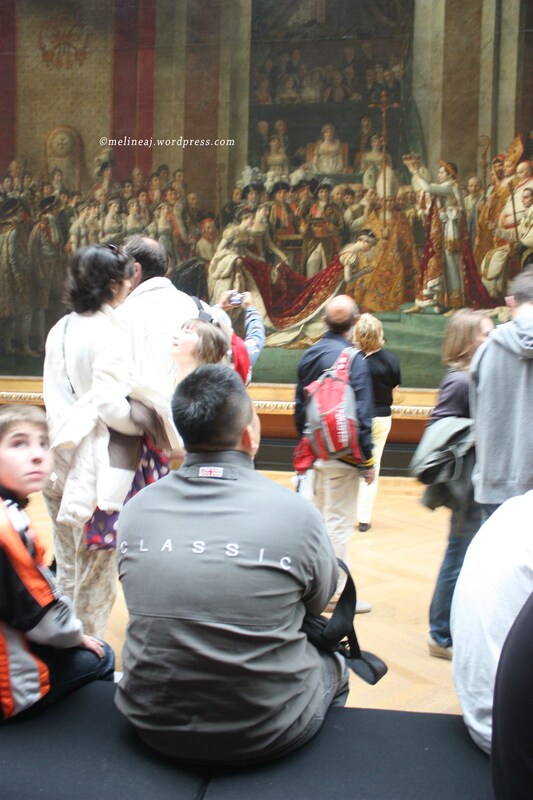 I expected to be overwhelmed and immersed in the art world while visiting Louvre but that didn’t happen. In fact, the painting and other thing was a bit below my expectation. I’m not an artist nor know a lot about painting and statues but I DO appreciate art and admire the works of talented artists. Maybe it’s the globalization effect and digital era that exposed us to the internet in which you can easily google any famous paintings and admire them from the convenience of your house – miles away from the real ones. At the end of the day, the humongous size of the paintings still made me humble and I can’t stop wondering of how much work did the painter put to make a masterpiece like those! 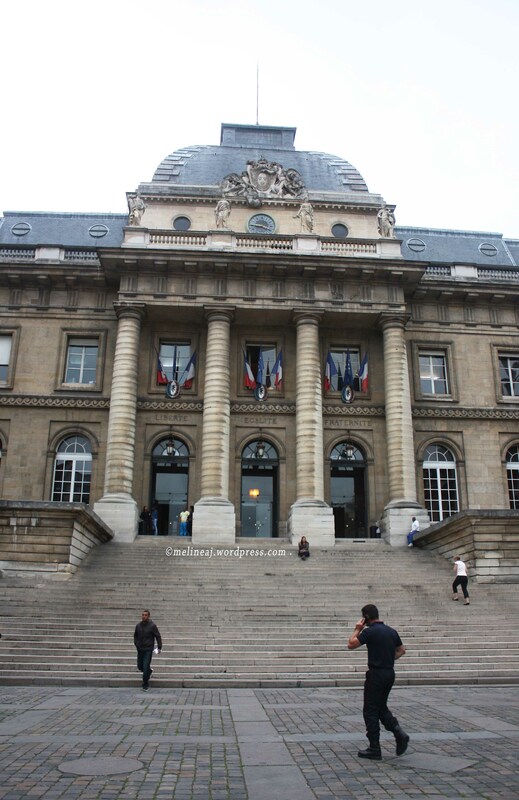 Our next destination of the day was exploring Ile de la Cite – a small island south of Louvre museum. We took metro and stopped at Saint Michele — Notre Dame. Right outside the metro station was the Palais de Justice where Sainte Chapelle was at the courtyard. When we arrived, the Sainte-Chapelle was closed for lunch so we visited Notre Dame de Paris first. The entrance to the church is free and the line up wasn’t that bad – although it did look very long, we only waited for 5-10 minutes. The audio guide was available for rent at the entrance of the church. At the right wing of the church, there was a small opening with cashier booth at the front. We thought this was the entrance to the top of the church. 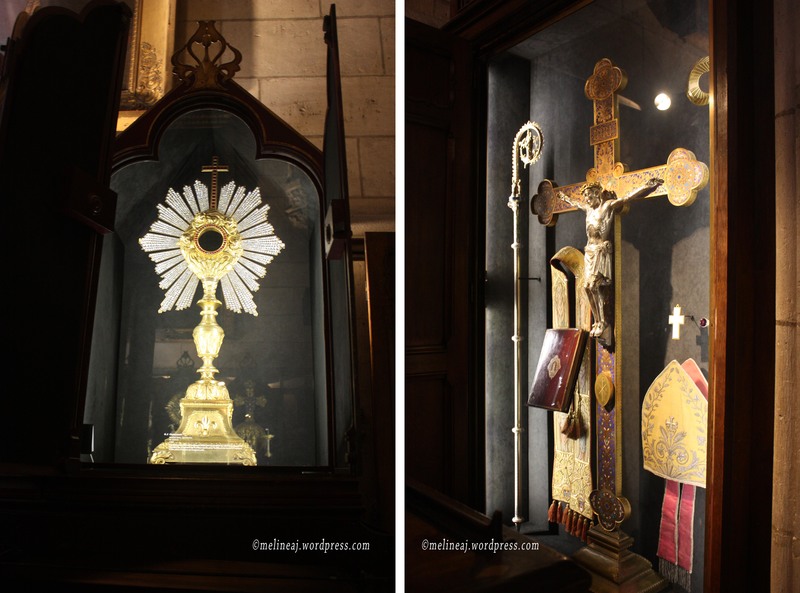 After paying €4 per person, we found out that it was a treasure exhibition in which there are things the pastor used during ceremonial events. We were a bit disappointed and this may not worth it in my opinion. In front of the church, there is access to the ancient crypt but it costs extra €€€ so we skipped this. Notre Dame de Paris was pretty impressive. The round stained glasses at the right and left door near the altar were simply beautiful. Afterward, we walked back to Sainte-Chapelle church since my coworker highly recommended us to go there. He said the floor-to-ceiling stained glasses around the church were amazing. We paid regular price €8.5 each person for the entrance. 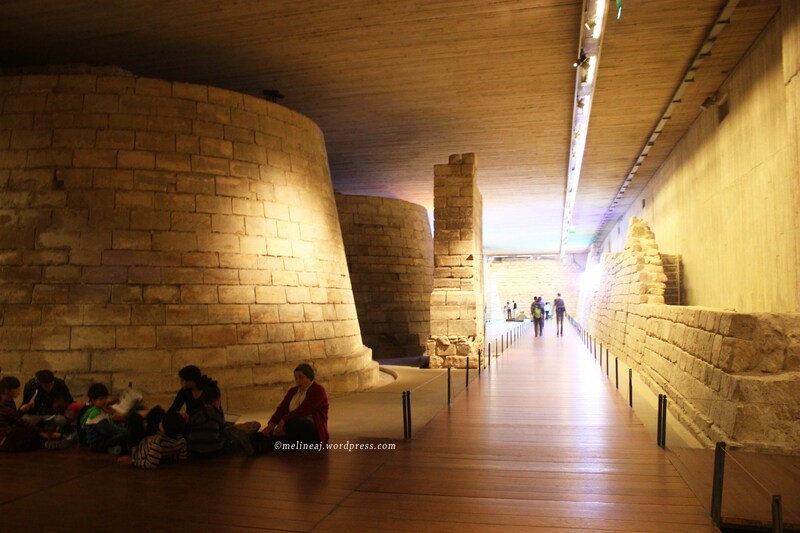 The only discount from having Paris Visite Pass is that if you want to combine the admission fee and ancient crypt ticket (I think it was €2 more after discount but skipped this one too). The first floor of the church was kinda gloomy – my husband thought it was the whole church and was about to complaint hahaha. After walking up small stairways, we arrived at the actual church. The stained glass was not disappointing but the construction was! They actually covered the left side of the church – which was HALF of the church – when we were there! Bummer…. From the signage, I read that the renovation will be going on until 2013 and maybe 2014. From the renovation movie, the restoration of the church includes replacing the glass with lead with new and safer material. They do extensive research on the new material so that it maintains the original look. So yeah… if you’re planning to visit in a near time and you have spare time & money, you can go there. Otherwise, wait until they finish the restoration sometime next year. Before heading out to other area, we stopped at a corner cafe in between Sainte-Chapelle and Notre Dame. We passed this cafe when we walked to Notre Dame earlier and our mouths were watering from the smell of delicious crepe! The cafe has inside and outside seating. We ordered a basic sugar crepe for only €2.5 and an espresso for my husband. We sat outside watching people walk by and enjoyed Parisian breezy day. Ah… life is good hahahaha…. 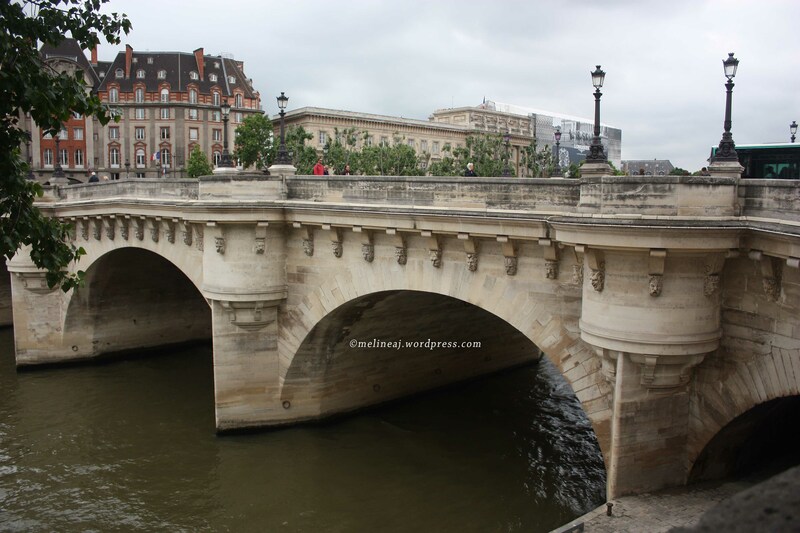 With recharged enery, we walked away from Notre Dame toward Pont Neuf – the oldest bridge in Paris. Nothing special here so we just took pictures and continued our exploration. 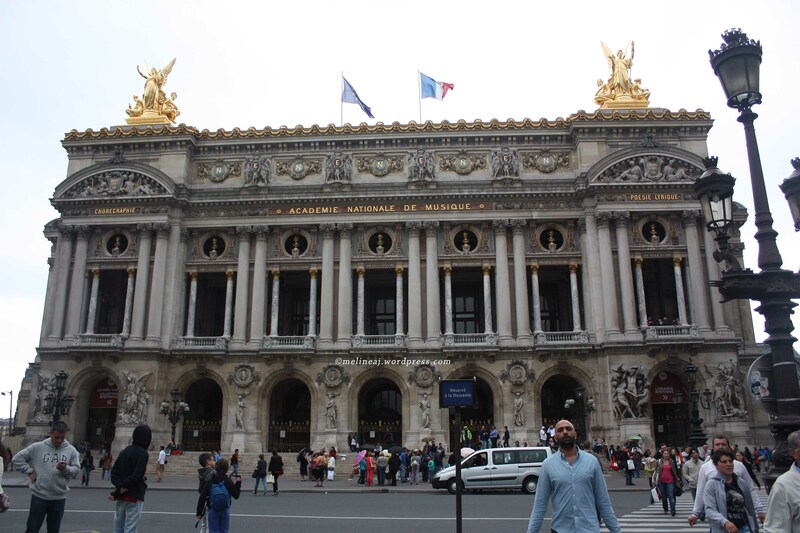 My husband wanted to see Paris Opera Building since he saw this beautiful building at one of the travel show on TV. We stopped at Opera metro station and right outside the station, there was the building. For some reason, my husband insisted that it wasn’t the one that he saw on TV. We even googled it and it was the one… Yeah… it was just a building for art shows and nothing special about it. Maybe if we were able to enter the building, we might have different opinion since my husband said that the inside of the building was beautiful. Around this area, we witnessed the actual pickpocket! Me and my husband stopped at the sidewalk since I need to put a bandage to my ankle. I told my hubby to watch my back in case of any person tried to do something bad to me. I also warned my husband to be careful for his backpack – although I knew he already locked it. Then a moment later, a group of young girls (about 10-15 years old) bringing clipboards passed us. I suddenly alerted my husband that those might be the pickpockets who ask you to sign petition and would go through your bag and pocket while you’re doing so (I read this in so many forums and blog about Europe scams). Less than 2 minutes later, a Korean lady passed by us and my husband saw one of the girls took this lady’s wallet from her jacket pocket! But then the girl quickly put the wallet back to the pocket. The Korean lady realized what happened and screamed something to the girl. This when the girl tried to run away from the lady and bumped my husband while he was checking the map on this smartphone. I was getting anxious that something was taken from my husband too! I shouted to my hubby and he already checked all his pockets. Fortunately, his wallet, cellphone, and passport were still in his front pocket. One of the local who saw the event too, shouted to the girls to warn them that there were police around. We quickly moved away from the area and went inside one of the shops. My husband said that there were 2 people who preyed on me while I was bending down putting my bandage. One was a guy who later we saw selling €1 bottled water at the corner of big shopping area and another was an old lady that we saw giving a small stone to a passerby. They looked directly at my bag even though I tried to put my bag in front of my body – in case I slacked off and had an opened bag. Once they saw my hubby on my side, they cancelled their evil plan. So, it was really my advantage having a big tall hubby hahaha…. 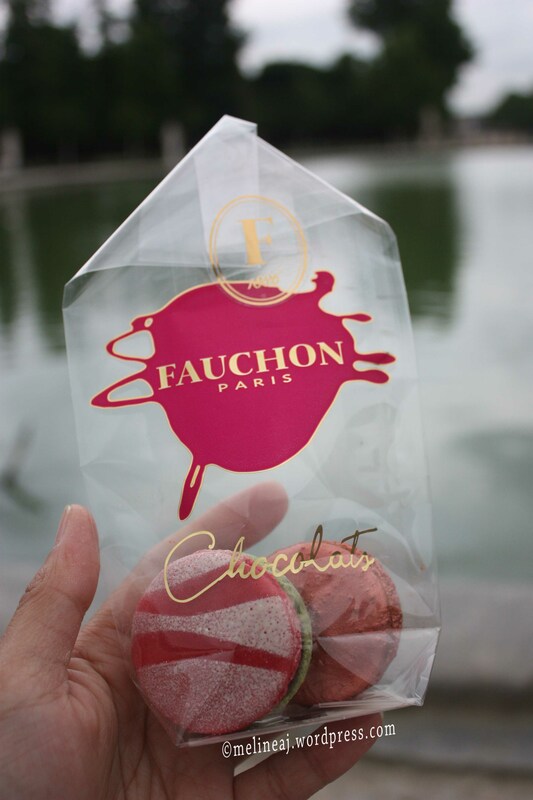 With no clear destination, I suggested to go to Fauchon near Madeline metro. According to one of the guide book, this store sells high end grocery items. There are actually 2 stores nearby: the patisserie selling pastries & macarons and the epicerie selling home-made jam, cookies, and wine. I bought 2 macarons here: the pink and green shell on each side with strawberry jam filling and the orange metallic shell with chocolate filling. The macarons were just okay – I might be bias since I already tried Pierre Herme ones hahaha… I also bought a chocolate pack that has different percentage of the cacao content – these, I haven’t tried yet… they’re still on my cupboard hohoho… The shop display was pretty amazing. It looked like a pink ferris wheel candy. 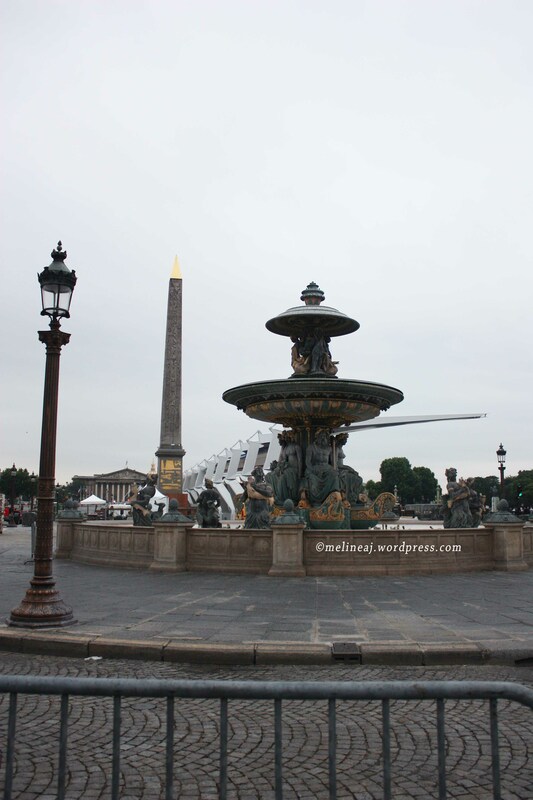 We decided to end our day by visiting Place de la Concorde before having dinner. I remember seeing this famous fountain in many movies like Devil Wears Prada. 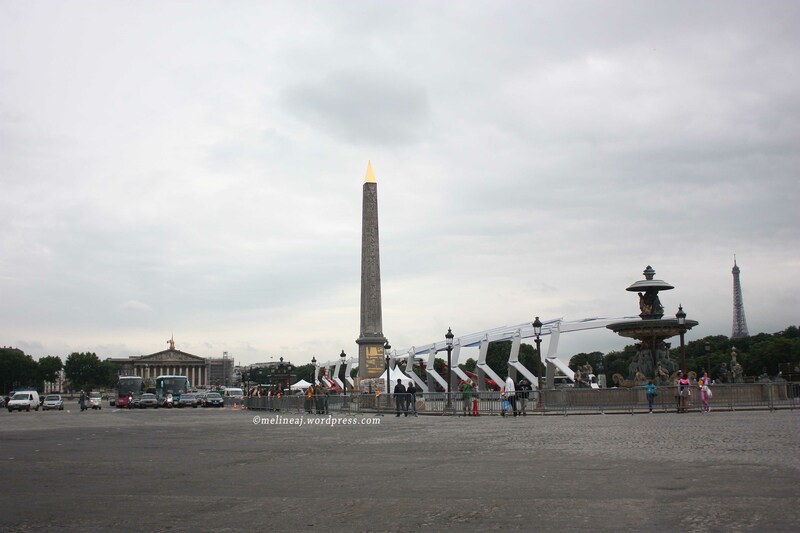 Unfortunately, the area was partly closed because of national ceremony preparation that was due in the following 2 weeks. The fountain was off too… So we just walked pass it and took picture. 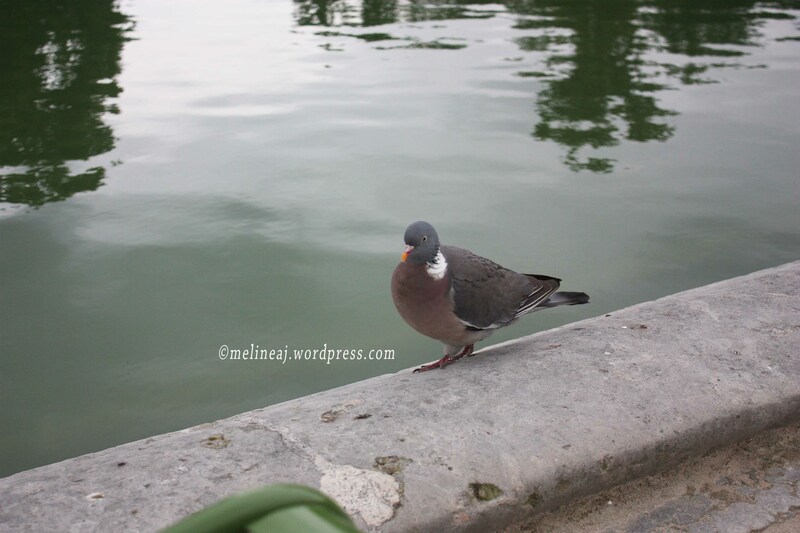 Nearby, there was Jardin du Tuilleries. This garden actually connects Place de la Concorde to Palais Royal and Louvre Museum. There are lots of green chairs around the big pond. The garden was green with lots of trees and pretty roses bush. There are a lot of pigeon too eating crumbs from people having snacks. They flew closer to me when I ate my macaron hahahaha… We took a long rest here while enjoying the evening. My hubby even fell asleep because of the cool breeze. 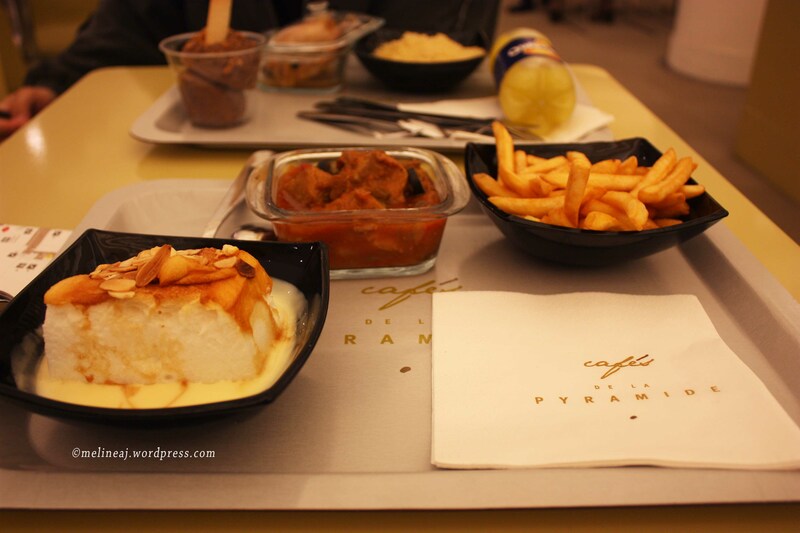 For dinner, we wanted to have an Parisian experience for once. So, my hubby found a restaurant nearby called Lescure Restaurant that has high rating on Trip Advisor. The location itself was kinda hidden. It was at a corner of a small alley. The restaurant was small – only about 7-8 tables inside and 4-5 tables outside. 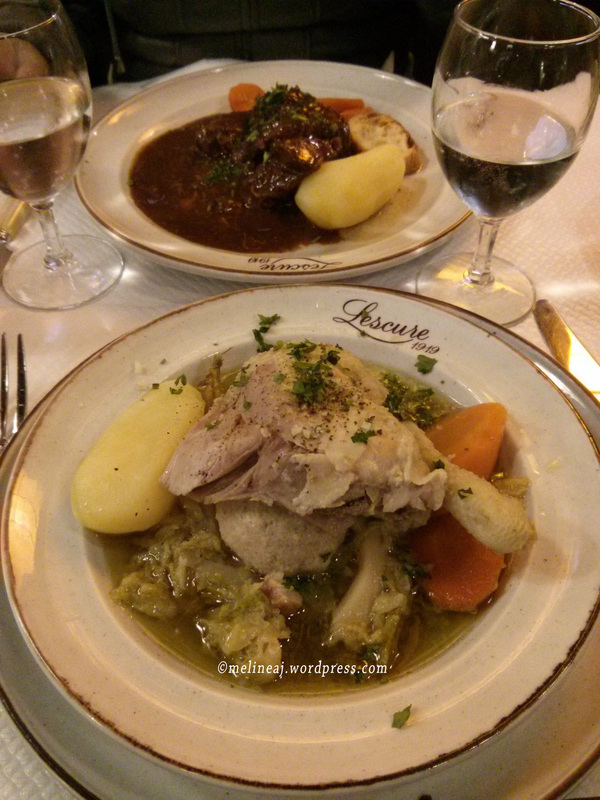 I ordered Le boeuf Bourguignon garni and my hubby ordered La poule au pot farcie Henri IV (stuffed boiled chicken). The food was delicious! The beef bourguignon was tender and the flavor was good. My hubby chicken was super tender and the soup complements the flavour of the chicken. With full stomach, we headed home by metro. We stopped at Monoprix near Grenelle metro to buy breakfast for the following day since we planned to go to Versailles. Monoprix is a chain convenient store that sells cosmetics, clothing, everyday needs (shampoo and soaps), and ready to eat food (pre packaged sandwiches, yogurt, and milk). The sandwich price was okay and it was good for a quick-cheap grab. 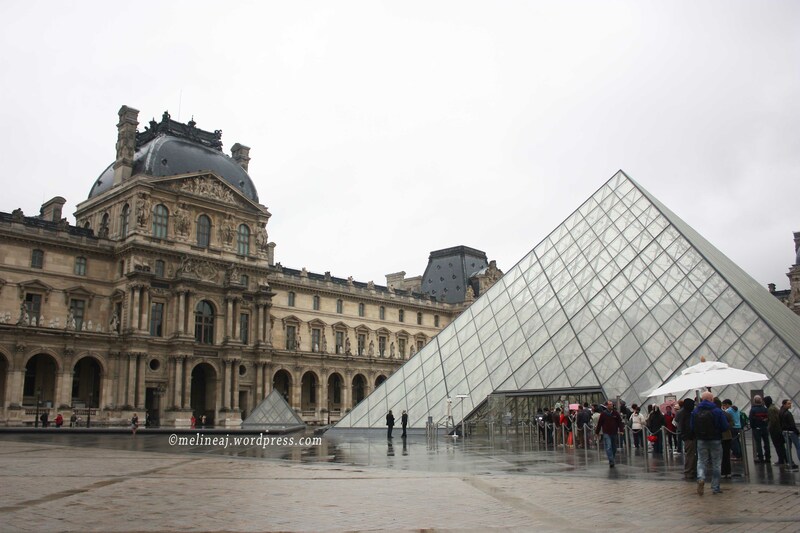 3 Responses to "Paris Day 2 (Louvre Museum, Notre Dame, Sainte-Chapelle, Pont Neuf, Opera, Gallery Lafayette, Fauchon, Place de la Concorde, Jardin du Tuilleries)"
=) can’t wait for my days in Paris too, especially Louvre Musee!!! Woooo!